Though unemployment is low and tax revenue is on the rise, big bills coming due for the state’s highways and health care programs are giving Texas lawmakers some heartburn. The Texas economy is growing healthily, but that doesn’t mean state budget writers will have more money at their disposal next year, state officials said Tuesday. In fact, though unemployment is low and tax revenue is on the rise, big bills coming due for the state’s highways and health care programs are giving Texas lawmakers reason for concern. “I would like to offer a few words of caution for reading too much into the positive recent economic numbers,” Texas Comptroller Glenn Hegar told lawmakers at a Senate Finance Committee hearing. As they often do, state budget writers last year underfunded Medicaid, the federal-state insurance program for the poor and disabled, which, alongside public education, makes up one of the largest shares of the state’s $217 billion two-year budget. Then, during a special session called by Gov. Greg Abbott over the summer, state lawmakers shifted another $500 million away from the Texas Health and Human Services Commission to pay for public education programs. As a result, lawmakers could face a $2.5 billion Medicaid bill shortly after they reconvene in Austin in 2019. Then there are the additional drains on Texas coffers from Hurricane Harvey recovery efforts, Hegar said. That’s bad news for lawmakers given the comptroller’s prediction that the state will only have a $94 million “beginning balance” when lawmakers convene in 2019. By comparison, lawmakers had an $880 million beginning balance in 2017, which was ultimately a tight year for the state budget. Two years before that, lawmakers enjoyed a $7.3 billion beginning balance. “I’m also grateful for your sobering reality comments that it’s going to be a tight session — the cost that we’re looking at,” she said. Another source of heartburn for budget writers is the ravenous state highway fund. In 2015, amid complaints of a highway system in disrepair, Texans voted to amend the state Constitution to require that up to $2.5 billion in sales tax revenue be dedicated to the highway fund. That means that even as Texas collects more money from sales taxes — Hegar testified that sales tax revenue grew by an average of 10.3 percent over the last three months — the rest of the state budget will not benefit from that revenue since it is earmarked for the highway fund. That was also an issue for budget writers in 2017. Last year, in order to free up some of that money for other purposes, Senate lawmakers pushed for an accounting trick that delayed a payment to the state highway fund into the next two-year budget cycle. That freed up about $1.6 billion for lawmakers last year, but it means there will be another bill to pay in 2019. “In short, despite a strong economy and positive outlook for revenue growth in this biennium, it seems likely the next budget will be much like the one crafted in 2017, having to contend with restricted revenue relative to the spending trends of the state,” Hegar said. Still, the comptroller stressed there was good news. Unemployment is hovering below 4 percent, which is the lowest it’s been in four decades, Hegar said. Even Hurricane Harvey, though devastating to the cities, counties and families of southeast Texas, has created a small, macroeconomic boom for the state. Since so many Texans lost their cars to floodwaters, there was a short-term boom in new car sales, leading to a 13 percent growth in motor vehicle tax revenue over the last quarter. Ditto a small bump in sales tax revenue, as flood victims rushed to replace items lost to the storm. 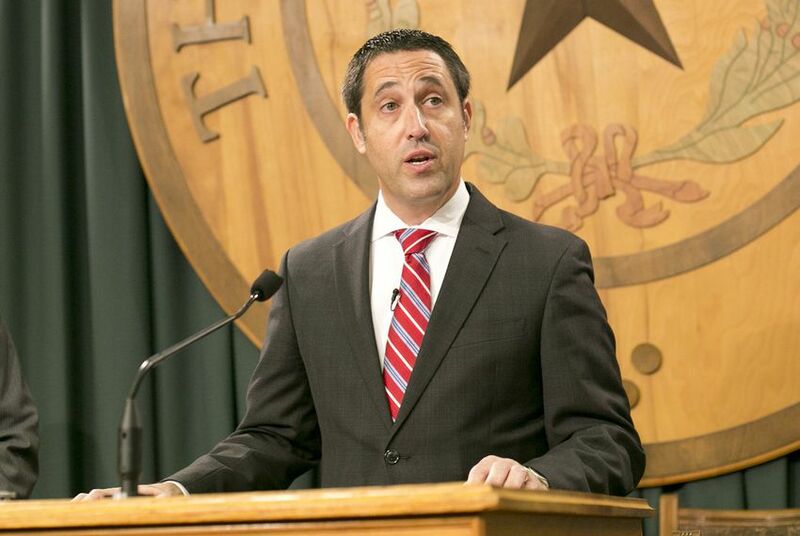 And if oil and gas tax revenue continues to rise — oil prices are relatively high, Hegar said — the state can expect the balance of its emergency Rainy Day Fund to grow to more than $11 billion next year. Other rainclouds loom on the horizon for the state budget, however. The Texas Tomorrow Fund, a public university tuition payment program that stopped accepting enrollment in 2003, is projected to face a $240 million budget shortfall. The state treasury will also soon feel the effects of an amendment to the Internet Tax Freedom Act passed by Congress, which is expected to cause a $440 million loss in sales tax revenue. Correction: A previous version of this story incorrectly said that the Internet Tax Freedom Act passed by Congress caused a $144 million loss in state revenue. It caused a $440 million loss in state revenue.